Original content produced by this site. Below is a page from Newby Island Expansion EIR, where you can see that the health hazard index with expansion (“Project Conditions”) is worse than “Existing” and “Immediate Closure”. While the EIR author concluded that the increase is insignificant (just like odor is insignificant), the index only covers cancer, chronic and acute illnesses. But EIR didn’t cover minor health-related impacts most residents are complaining about – stress, depression, sleep disturbance, appetite loss, headaches, asthma, nausea, etc. Recently – EPA, CDC, County Public Health are coming out with statements that quality of life impacts from odor is a Public Health issue. We have made the following observations about the reports included there, and would like to make some comments. First, these documents still do not include individual odor flux measurements from the active landfill, but we can infer from the data samples from the memorandums that the Newby’s covered and closed landfill is a source of offensive odor. As you may see, one value clearly stands out, and that peak value, according to the authors, is due to surface breakthrough (P.12, second paragraph) on a dry soil surface (table on P.22), on a covered and closed landfill (P.18.). Second, Dr. Schmidt revealed a single “Actual Measured Landfill Average” to represent the tons of historical data that the landfill has been and is still collecting. This is an irresponsible way to inform the public and decision makers. Methane is a highly flammable gas. The government has strict requirement on methane monitoring for landfills. As a result, Newby has at least several hundreds of methane probes put in the grid cells throughout the facility (P.9. in report for sample grid location). And they set up a system to collect data at all these cells around the clock. They should also report these data to EPA. Let’s say they have 300 probes, and they take measurements every 30 minutes. They then will have 14,400 methane measurements every day. Over a month, they would have 446,400 measurements. And they would take all these about half a million numbers and give a grand average. And that’s all they have for you and the public. Let me explain what they are not showing. At every 30 minutes, all about 300 probes are recorded. They can do a total or average of these 300 readings, and should also report at least the maximum, or the biggest reading out of the 300. Let’s call the average of the 300 readings “site-wide average”. As you may notice, the surges that happen from time to time are the times when Newby is cooking, and gives off foul smell. This red horizontal line is the odor threshold, above which BAAQMD would get complaints. The higher the surge, the more complaints. As you know, the landfill is not active all the time. In fact, most of the time all Newby surfaces are pretty quiet. The catch is, if you take all this data, and find a grand average, you will get 2.80, which is the blue line near the bottom that you see. This 2.80 is exactly the same value that Dr. Schmidt reported. This graph shows what he did not show. In other words, Newby concealed a historical report like the time chart above altogether. This time chart would clearly reveal the odor outbreaks, even though the grand average is as low as 2.80. This kind of data is very similar to earthquake data. They are what we call “skewed”, meaning most of the values are very low. But in both cases, the occasional peak values would bring big social, economical and environmental impact. Take a look at this USGS’s earthquake record from 1985, of all shakes with magnitude 2 and above. The grand average of all these magnitudes would be lower than 3, which is not a magnitude we need to worry about. As a decision maker, will you just look at the average, and sit back and relax? EPA would review a lot more than an average. Newby already has a capable IT team that prepares data reports to EPA on a regular basis. They don’t need to do an expensive “odor study”. They only need to publish their data report to EPA on the web, and include time charts like the above. Please urge them to do so ASAP. Third, Dr. CE Schmidt’s data analysis of multiplying the average by surface area is really mind boggling. I wonder why he left out the entire Pacific Ocean. Even though it is not in the immediate vicinity, the Pacific Ocean is where all our wind comes from. Using Dr. Schmidt’s technique of analyzing data, by taking average and then multiplying by the area of the odor source, Dr. Schmidt will be able to conclude that the Pacific Ocean will pose a disastrous methane threat to all citizens on the west coast. With all due respect to Dr. Schmidt, and his contribution to environmental chemistry, his data analysis techniques need to reflect some common sense, and basic understanding about statistics. EPA would not trust a data analysis report like this. Neither should you. As a city planner making a decision that carries such enormous environmental impact and social responsibility for millions of commuters, residents and visitors from all over the world, please take careful considerations of the situation. Please do not be misguided by some unprofessional ways to conceal and manipulate data in order to blind people’s views. The odor source is where you find the peak value in measurements of an odor substance that is over an odor irritation threshold. Undoubtedly the Newby landfill is a source of offensive odor in our area. Republic Services repeatedly denies its responsibility. It conceals relevant data. It manipulates data in unprofessional ways to mislead the public and decision makers. It makes irresponsible generalizations. It is a disgrace to the Silicon Valley. It is a neighbor we would rather not have. Please make the right decision and do not let the Newby landfill expand to new heights. Please reject the PD zoning permit. Letter to the SJC from one of our group member, remember to join us for the May 6th decision making meeting. I am writing to request your consideration to reopen public hearing on May 6th as there are many material facts and changes that have occurred since February meeting. 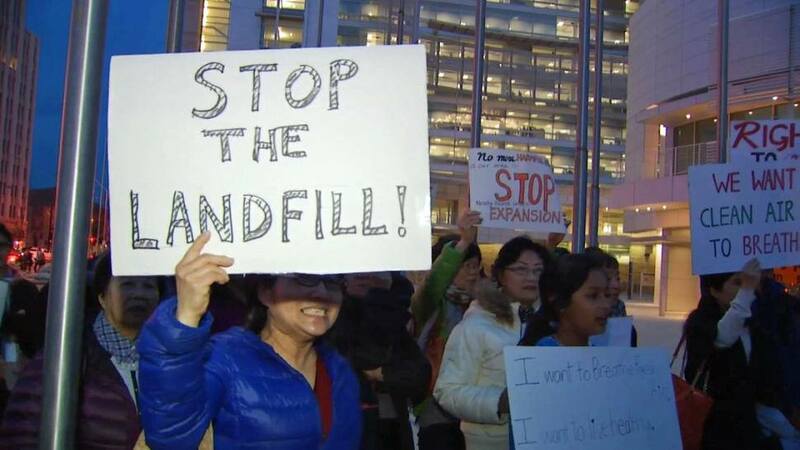 “Stop Newby Island Landfill Expansion” petition has now exceeded 22,000 signatories including over 5500 San Jose residents. If a full public hearing is not feasible, kindly allocate a 20 minutes block for Citizen Grassroot Movement representatives to present new data. If we use Schmidt-Card’s calculations, the Pacific Ocean will appear to be 10 million times stinkier than the Bay, or that the clean air in our home is 190x stinkier than a kitchen trashcan. Once normalized, we can now fairly compare odor concentration. Sure enough, the NIRRP Working Face (or active landfill) has an average odor flux of 59 DT/min-m2. That is by far the stinkiest source, >10X worse than the Bay. DT=7 is typically employed as detection threshold for odor regulatory enforcement. I hope it is now clear to you how Republic Services and Schmidt-Card skewed their charts to conceal high landfill odor concentration. Schmidt-Card’s so-called scientific reasoning and conclusion of the bay being the largest regional odor source is nothing more than an act of public deception. This odor study is just one of many fallacies Republic Services continue to present to you, various agencies and the public. With 6 Public Nuisance Violations in the past 6 months, and thousands of odor complaints that span decades, City of Milpitas has adopted a resolution that Newby Island is a Public Nuisance on April 21’2015. The number of odor complaints in the most recent 12 months is 80X higher the average odor complaint per year recorded during the EIR study period. I hope you reckon the adverse impacts on the hundred thousands of people who live and work in the vicinity of the landfill. There are better alternatives available through waste diversion programs and effective utilization of the millions of tons of excess capacity in the 5 existing landfills within San Jose City, and projected by CalRecycle to last for many decades. Hence, a permit that grants an unprecedented bayfront landfill expansion in one of the most populous, environmentally sensitive region, within the main corridor of Silicon Valley corporate offices, in an era when bay area cities are committed to zero-waste initiatives and shoreline restoration is simple irresponsible. San Jose Municipal Code Section 20.100.940 states that a PD permit can only be issued if the environmental impacts of the project, including, but not limited to noise, vibration, dust, drainage, erosion, storm water runoff, and odor which, even if insignificant for purposes of the CEQA, will not have an unacceptable negative effect on adjacent property or properties“. California Code of Regulations Sections 15162, 15163, 15164 also states that the lead agency has the right to prepare subsequent, supplement, or addendum to a certified EIR on the basis of substantial evidence. You have the power to stop the landfill expansion! Please uphold the spirit and letter of aforementioned California and San Jose City regulations to protect the public by denying the Newby Island Landfill Expansion Permit on May 6th 2015, and request the preparation of additional EIR on project alternatives. Happy Earth Day! Educational 13 min video and slides explaining myths and facts on the Newby Island Landfill. Protect our environment and communities today. Learn about the Newby Island Expansion and its adverse impact to the environment and communities surrounding it. Stop Newby Island Expansion Facts – YouTube. On March 11th, 2015, we were invited for a tour of the Newby Facility. Here are our notes from the tour. Also in the doc, you can access photos and a video. Republic’s Newby presentation in Milpitas 03/04/2015. If you follow the link to playlist, you should be able to find specific sections including the Q&A. Follow this link to YouTube.